One of the most beloved folkloric Christian dramas, Las Posadas, was introduced in 1587 by Fray Diego de Soria, an Augustinian Friar in the church of Alcoman, Mexico. Used as a vehicle for conversion to Christianity, its popularity takes origin in the love and hearts of our Indo-Hispanic people who continued the tradition through the ages. The sung colloquy, based on Luke 2:1-14., tells the story of Mary and Joseph’s journey to Bethlehem seeking shelter in anticipation of the birth of Jesus. The “jornada” (journey) is re-enacted for nine consecutive days. This novena begins on December 16 and ends on Dec. 24. The musical choices depend on the prayer format, where and how it is celebrated. Las Posadas, found in most hymnals, is the familiar and traditional text sung when the pilgrims arrive at each location. Hymns that carry the theme of the novena are included in the prayer service and final celebration. “Toda La Tierra” (Orlando Rodriguez/Rogelio Zelada): “Voy caminando por este mundo, te voy buscando en mis hermanos;” Levántate (Cesáreo Gabaráin): “al mismo Dios recibiré. En mi interior se sembrará;” Ven a Nuestro Mundo (Antonio Alcalde):“con la Virgen Madre, te espera la Iglesia), “El Dios, con nosotros, ya está en nuestra tienda;” Que se Abran los Cielos (Eleazar Cortés) are examples of texts that carry the theme. “Ven, Señor a salvarnos/Come, O Lord, set us free” (Reza). This common psalm may be sung as a response to the Scripture Reading. “Daniel 3: Canto del Universo” (Juan Espinosa) this simple, joyful setting of the canticle, can take the place of one of the readings. Bernadette Farrell’s "Litany of the Word” and Dan Schutte’s “Litany of Peace” may be sung in place of the traditional litanies. As “Las Posadas” has united us to the past, today it continues to unite neighborhoods and parish communities. In some areas it is celebrated as an annual city-wide event stressing the need to care and provide shelter for those in need. Making good hymn choices supports the meaning of this Christian drama. 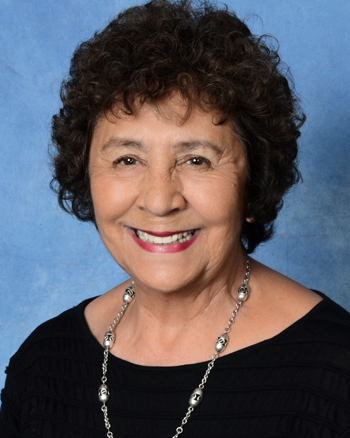 Mary Frances Reza is one of the grande dames of Hispanic music and ministry in the US. Known for her bilingual psalm settings, she remains active locally and nationally, working to ensure the ever-increasing role of Hispanics in the Church.